Even with the uncertainty of these last few days, I reviewed, studied and took the AHIMA assessment. After several grueling hours and support from so many – I passed! I believe in ICD-10 and the enormous benefits, research potential and opportunity for advancement for our healthcare system. 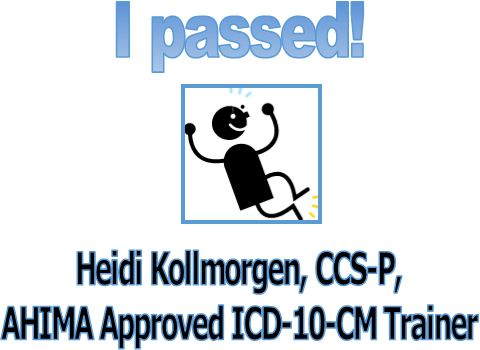 This entry was posted in Medical Billing and Coding and tagged AHIMA, AHIMA Approved ICD-10-CM Trainer, healthcare consulting, ICD-10, ICD10Watch, medical coding. Bookmark the permalink.